The city rarely gets to host an honest-to-goodness Russian oligarch. But there Shalva Chigirinsky was, pacing the fifth floor of the Fairfield County Courthouse on Tuesday in an impeccably tailored suit, amidst the poor and disenfranchised. The 67-year-old Chigirinsky was once considered one of Russia’s richest men, with a fortune estimated by Forbes at $1.6 billion. But that was before his divorce in 2009 from Tatiana Panchenkova, a willowy blond and daughter of a former Russian ambassador to the U.S.
Chigirinsky is now in court, before Superior Court Judge Mark Gould, seeking a court order to reunite with his 12-year-old daughter, who had previously claimed he sexually assaulted her at their former Greenwich home. Chigirinsky took the witness stand as his ex-wife, who is vigorously opposing the court action, sat next to her lawyer, Norman Pattis. In a thick accent, Chigirinsky testified he currently sees his other three, older children. Asked who was responsible for his children’s’ distrust, Chigirinsky motioned toward his ex-wife, who was calmly listening to a Russian translator. “The mother and her household have filled the entire nest with lies,” he said. Chigirinsky hasn’t seen his youngest daughter since March 2016, when he was charged with two counts of risk of injury to a child for allegedly sexually assaulting her. 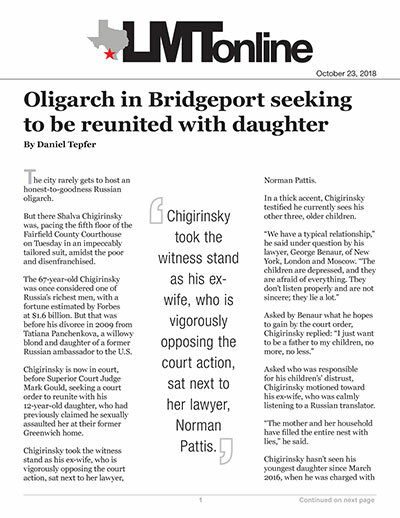 The charges were dismissed after prosecutors in Stamford said they could not prove them beyond a reasonable doubt, and Chigirinsky has been seeking to be reunited with the girl ever since. But Hartford clinical psychologist Nancy Eiswirtha, who was appointed by the court, testified Tuesday that the girl doesn’t want to see her father and is upset that he isn’t in jail. However, Eiswirtha said, she is still recommending that Chigirinsky eventually be reunited with his daughter. Chigirinsky and Panchenkova divorced in 2009 and have been fighting over custody and visitation rights since then in courts in Moscow, London, New York, Stamford and Waterbury. The family previously lived in a multimillion-dollar Greenwich home and a $17.3 million upper East Side Manhattan condo. Panchenkova now lives with her children in a $10 million cottage in Greenwich while Chigirinsky, according to reports, moves between homes in Moscow, London and New York. During the divorce hearings, Panchenkova claimed that during their marriage Chigirinsky beat her on numerous occasions, once causing her to have a miscarriage.